Please Note: This post is an excerpt from a post on my old blog, Rachel Robin’s Nest. I posted a picture of these cookies on Instagram yesterday for the #SweatPinkAutumn challenge and the response was huge, so I figured I should share the recipe. Enjoy! This recipe is tried and true. It was given to me by my dear friend, Jaska, and it was developed by her grandmother. The joke in her family is: “You know it’s a Grammy recipe when it’s got 4 cups of flour in it!” And yes, this recipe has 4 cups of flour in it. But the resulting cookies are so flavorful, and so fluffy, you won’t even care that they are probably pretty bad for you. I did however, make a tweak to this already amazing recipe. I decided to swap the oil for some homemade applesauce–WINNER!!. It really gave the cookies additional depth and moisture, and there are actually tiny pieces of cinnamon-y apple in them. SO. GOOD. 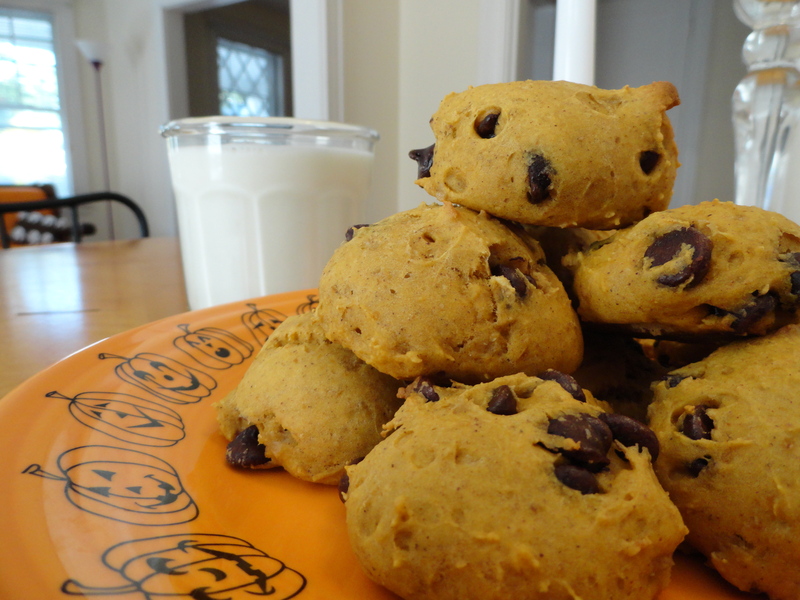 In a large bowl, mix pumpkin, eggs, oil (or applesauce), sugar, soda, milk, and vanilla until well combined. Mix in the flour a bit at a time, stirring until just combined. Fold in the chocolate chips and nuts, if using. Scoop onto parchment lined baking sheet and bake at 375 for about 15 minutes. The edges will be just turning a golden brown. I have to say, I’m really proud of myself, because this recipe is supposed to yield 4 dozen cookies. Usually, I end up with less than three dozen, because I am physically incapable of making small scoops of cookie dough. My cookies always turn out to be ridiculously large. Jaska and her mom, Sabrina, always used to tease me about my XXL cookies. 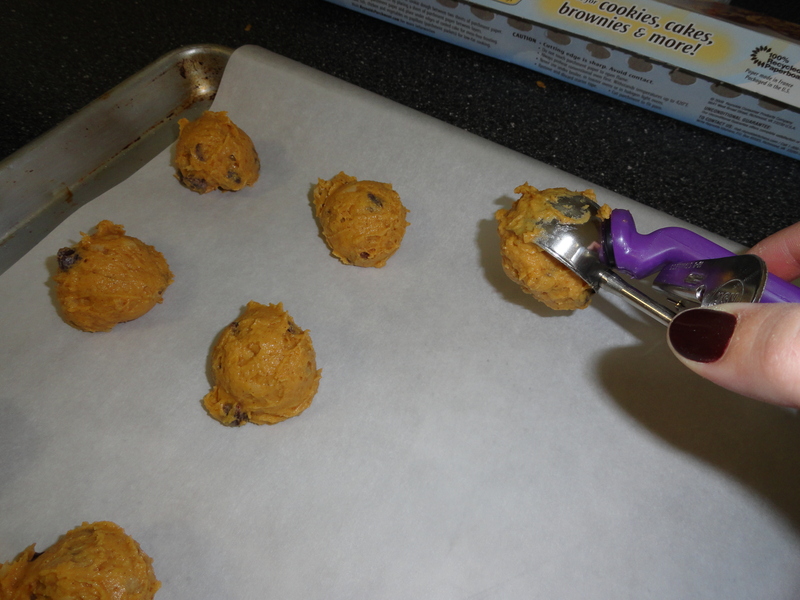 HOWEVER, this time, I used a measured cookie scoop. And I ended up with 4 1/2 dozen cookies. Hooray! See how nice and small and even they are? I love making these cookies because Jaska, Sabrina and I used to get together each winter and bake them together. It was always after Christmas, because we were always so busy during the holidays, but without fail, after New Year’s I’d get a phone call, and we’d set aside a date. I’d arrive first thing in the morning and we’d bake as many cookies as we possibly could-pumpkin, Grammy’s molasses cookies…whatever we had time for. And when we were all done baking, we’d feast on cookies with organic milk, or strong coffee sweetened with molasses. Making these cookies always brings me back to Sabrina’s warm, bright kitchen, and gives me the warm fuzzies all over. I hope you love them as much as I do! What’s your favorite pumpkin or fall-inspired recipe? Yummm! I need to buy more flour but these are going on the list of things to bake this fall! This recipe is definitely a keeper–I make them every year.